Last edited by Yezra on 12/08/10, edited 1 time in total. With the image of disembodied hands reaching out of the Mirror for Alarice burned into her mind, Sibelle stared at the hastily covered mirror with narrowed eyes. She had never looked into it before, or even noticed that it was there. But Alarice had wanted to see inside herself, as far as she could tell. Though she was fairly certain no one else could feel the chill in the air, she shivered and moved to unveil the mirror once more. Thinking that perhaps if she knew more about the nature of the object, she could uncover more about what was ailing the strange girl upstairs. When the image shifted, she jumped a little in place. Her spine was straight and she made a point of positioning herself so that the others in the room could not see. Her reflection had shifted, but barely. The woman resembled her perfectly, though one key feature had changed. In place of a scarf was a solid leather collar, and an appropriate tag. It was worn, and incredibly familiar. Though there were no grabbing hands, she scowled and tensed further at the image, prepared for the worst. As it shifted again, she stepped back slightly.. but still no hands came. Instead her image flickered, but once it stabilized it was evident that it was the same. No change had been seen for her visually. Though she knew nothing of the mirror itself, she suspected this wasn't the norm, but covered it again anyway and sulked back to her seat for a time before heading upstairs. Vandall was on his way out of the tavern late last night when he noticed the Mirror. It appeared to be such an innocent thing, but somehow he felt drawn to it. He had seen people standing before it in the past, for many long moments some of them, and there was something odd about it. The night was late. 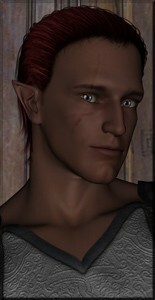 He had just seen Duvessa, Zaherha, Emeraven, and Tomias depart for the evening. He looked around, and discovered that, strangely enough for such a popular place, he was alone. Quietly, he set his mug aside, the milk having gone warm from the night's lengthy discussions. He rose, and approached the mirror, casting casual glances about to see if anyone else was watching him. How vain he would feel if any were to see him. As he approached, his reflection came into full view. It would be a lie to think that the swarthy young half-elf didn't smile in appreciation, for he was not terrible on the eye. He wouldn't win any beauty contests, nor would he attract women like moths to a flame, but he felt confident and satisfied in his appearance. As if in response, his reflection began to change. His dress became more elegant, his demeanor more sure and confident. Most importantly, his face belied a sense of true *peace*, not a spot of turmoil to be seen. At his arm walked the most beautiful tier'dal woman he had ever seen. Her hands clutched his elbow as they walked, and that simple gesture alone almost stilled his heart. Her dress of purest white covered her generous curves - only barely - and somehow, he knew those curves were meant for *him*. Then, a thing happened that *did* stop his heart - she leaned upward, as he saw himself bend at the neck - and they kissed. If that was not enough, as the two continued their walk, they were followed by two smaller versions of themselves - children? Theirs? They frolicked and skipped behind them, playing some childhood game that he, himself, had long forgotten. The foursome approached a generous home, hedges well-manicured, flowers lining the walls. There was an air of happiness to the image, not just because of its wholesome nature, but because the four seemed so genuinely *happy* and content, something Vandall himself had never been allowed to feel. He felt valued - accepted - and loved. He felt his eyes mist over, but try as he might, he could not pull his gaze away. He slowly reached out a hand, wanting to touch the skin of that woman - even if only for an instant. His fingertips barely grazed the glass, and the metamorphosis was immediate. Black clouds coalesced in the sky above the home, and dark, hazy smoke began to descend on the image in the mirror. Vandall's eyes widened, panicked, and he suddenly thrust both hands forward, laying them flat against the mirror's surface. "Run!!! Inside!!!!" he shouted, but the figures in the mirror continued their leisurely stroll, unaware of the descending doom. Quickly, the entire image was filled to black - and not just 'black', but the blackest of black - the kind of darkness only found in the deepest recesses of hell. He immediately recognized the image as it became light enough to see: Beggar's Court. Dirty. Neglected. Unclean. It looked like it always had. Nothing about the Court *ever changes*. He saw himself wandering its streets, dressed in the very same outfit that he was dressed in at that very moment. Sure, by comparison to the denizens who lived on its streets now, Vandall appeared some rich lord slumming-it in one of Freeport's worst districts. But he knew better. This was where he *belonged*. This place reflected *him*. Murder. Villainy. Reckless anger, resentment, and unbridled jealousy of his betters. No woman but a whore would *love* him and every friend would *betray* him. Even his sister - the one rock in his life to date - had abandoned him - just as their parents had done so early in their lives that he had no memories of them. He clenched his fists. He saw himself walking the streets, looking for an easy kill. Looking for an easy score. Then looking for an easy night of 'passion' with the exchange of a few silvers. Teeth clenched, he slammed his fists into the mirror, once, and immediately the image faded, and once again his normal reflection appeared on its surface. His face was inches away from the surface, staring into the eyes of an angry half-breed, fear and loathing both present at the same time. Quickly, he backed away from the mirror, assured himself that no one else was spying on him, and departed. He stalked out into the pre-dawn night, hating himself all the more. The bar had long emptied save for one soul still wondering its empty bowls. Restless she paced the floors with the tapping of dainty high heels, looking for something, anything to distract her from the punishing insomnia. She paced in and out of the various rooms, taking in everything and dismissing it just as quickly until the shrouded mirror dipped into her vision. At first it was dismissed as quickly as everything else but a flicker behind the shroud caused her attention to snap back. Something was moving? A light of some kind behind the sheet. Curiosity was never the Koadaâ€™dals strong point, and slowly she approached. Hovering some distance away she watched the lights flicker, subtle and barely noticeable were it not for the dim light. â€œFire flyâ€™s? In here?â€ Her voice in a whisper, not that anyone was around to answer her question. Cautiously she reached out, tugging away the cover to free what she suspected were trapped insects. The lights were indeed dancing but removing the cover did not free them, they continued to dance along the mirrors glass as if trapped on the inside. Distracidly she dropped the sheet to her feet, slowly reaching out a single finger to poke gently at one of the pinhole lights in the otherwise normal looking mirror. At her touch the image rippled like water, though the glass was cool and hard and she recoiled in mild horror. She was cut off as the ripples moved along the mirror, and when they settled the reflection was different. She looked at herself, her long white gown replaced by frills and lace, proofed out over the bulky dipper of a child barely able to stand. White curls swallowed her face and tiny hands toyed with a gold ribbon in her hair. Behind her a man was sitting at a large desk, well dressed with a pair of glasses perched on the end of his eloquent nose. He was Koadaâ€™dal but the image was blurry, as if trying to remember a dream after waking. The room was silent and the tiny child tattled over to him, pulling at his leg for attention. He smiled down to her and patted her head but shooed her away to return to his work, a woman in a maidâ€™s attire rushing in to gather the tiny girl from disturbing her father. The maid scooped up the girl and her image flickered, the dark ebon skin peeking though the koadaâ€™dal guise. She whisked the child from the room, down the hall and past the body of a woman crumpled lifeless to the floor, the owner of identity she had stolen. â€œKessh... Goddess what is this? !â€ Zaherahâ€™s hand fell from the mirror in horror as she watched, the reflection seeming to tease her memories. 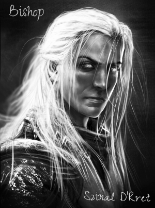 She knew the Tierâ€™dalâ€™s face too well, a woman who frequented her fatherâ€™s parties in Neriak. The images were familure yet not, her mind reeled as she fought to deny what she saw. As the image shifted again the tiny girl was long gone, whisked away by Kessh. The man from the desk sat in the hallway hovering over the body of his slain employee in horror. It was all the priestess could take before flinging the drape back over the mirrors front. Her hands shook and she slowly backed away, flush of all color and visibly shaking. Retreating into the night she made for Neriak, her step a bit quicker than normal. Khayte stood at the top of stairs midmorning. The breakfast crowd come and gone. The wait staff had already cleared the tables. They wouldn't be back for a little while before they came to prep for the lunch rush. She descended the stairs silently. She was in her hunting gear, but before she left to go attend to that, she noticed a tall mirror she had never seen, but had heard hushed rumors about. She shrugged and made for the door, but as she reached for the latch, she stopped. Standing very still for a long while, only the sounds from behind the kitchen door could be heard. A small sigh escaped the feir'dal, her shoulders slumped and she bowed her head. The mirror showed Khayte on a dais of sorts. She was smiling openly. There were several people around her. They were dressed in all manner of formal wear. Some warriors. Some mages. They were also smiling and each taking a turn congratulating her. They were shaking her hand or slapping her on the back. Then the image of Khayte looks up and the vision cuts to across the great room. At first there is a huge crowd of people, then they part and a single woman is revealed. She is breathtakingly beautiful. She is looking right at Khayte, a bright smile on her face and a brilliant radiance about her. The image flickers back to Khayte's face a moment and the joy and happiness is mirrored there. Switching back to the woman across the room, her eyes are still locked onto Khayte's. She makes her way towards her. She never falters or stops along the way. Various people approach her. She ignores them casually brushing them out of her way without losing eye contact with the woman on the raised stage. As she draws nearer, the various people try to touch her, distract her, divert her, kiss her. She pays them no notice. As she gets close, they become more aggressive, but her glow never fades. Her brow never creases. At the end when it seems they will plow her under with their mass, she effortlessly walks through. Reaching the dias, she climbs up and steps into Khayte's embrace. They seem to share some quiet words for a moment before they lean close and kiss with their arms around each other. The dignitaries stand by quietly watching over the couple. As they finish the kiss, they pull apart slightly but remain within each other's embrace. Their attention is drawn to the space in front of the stage and an older feir'dal couple can be seen. They resemble Khayte and they approach the pair of women. They share hugs all around. In the older woman's arms is a baby, which she passes off to the one with Khayte. The baby has the coloring of the woman now holding it. Another, slightly older child appears from behind the gentleman and goes to Khayte, wrapping arms around her legs and leaning a head against Khayteâ€™s hip. This one seems to be a small copy of Khayte. Now with children, the couple seems to enfold them into their happy pocket. Khayte stares at at the scene in the mirror. Her heart is pounding in her ears. Its ache is so severe, and she feels it will burst. She tries to soak in as much detail as possible, so as not to lose the sense of utter completeness and love it displays. She gasps out loud as the image shimmers and a new scene appears. The scene shows Khayte on her private island. There is a great party going on. She stands talking to friends as a woman stands next to her with their arms linked. There is a flash of motion, and the people in the scene seem to be in chaos. They are running away or ducking for cover. Khyate stands there frozen and unable to move to defend herself or anyone around her. The situation settles down and there are several bodies where once there were happy guests. Khayte is unaffected, but the woman who was standing with her is disheveled, her hair is a mess and she has soot and blood on her dress. She glares at Khayte. Khayte holds out her hands to comfort the woman, but she refuses her. A taller looking human in ornate plate approaches Khayte and has a stern look for her. She reaches out and grabs Khayte by the collar and yells into her face. She roughly pushes her away. Khayte looks dejected. The woman starts pulling weapons from Khayte, brandishing them in her face, and tossing them aside. Lastly, she pulls a ring from Khayteâ€™s hand and pockets it. She turns her back on her and leaves. Khayte looks up to the woman who was with her before to find a disgusted look on her face. This woman pulls something from her finger and tosses it at Khayteâ€™s feet. Itâ€™s a ring. Khayte stares at it a long moment then lifts her head to plead with this woman and gets slapped hard across the face. The woman turns her back as well and leaves. One by one, Khayte friends approach her. Several different things happen. Some simply glare, others punch her in the gut or slap her, but in the end they all turn their backs on her and leave. Khayte just stands there never raising a hand to defend herself. Her head is bowed and shoulders slumped. The scene in the mirror begins to shrink as if flying away from Khayte who stands there alone amongst the ruined party and dead guests. Khayte stands there. Her face is a tight painful grimace. Tears flow down her cheeks unchecked. Finally she growls out between clenched teeth, "Why? Why is it always so...?" Her question unanswered, she whips out a pair of daggers and storms through the tavern door. Jacob "Nince" Damien Reginald Albuquerque Lark watched carefully that night as people ambled around the mirror, taking turns with it, like an illicit drug. Nince congratulated himself on what he considered an apt comparison and took a celebratory swig from the small, unlabeled bottle of rum he held in his left hand, by the neck. He briefly considered sharing this comparison with the other patrons, but he decided against it, painfully aware that nobody was paying attention to him. Nince sighed and began to contemplate looking into the mirror himself. Nince was rarely the sort to pay attention to the emotional reactions of others, but even he could see that those who looked into the mirror were frequently quite shaken. He didn't think that it would have that much of an effect on him, but he worried about what the other patrons might think of him if they saw something they didn't like in his reflection. And they will, you know, he thought to himself. Someone will disapprove. They'll think less of you. But Nince was drunk, and when Nince was drunk he tended to act on his whims, and he knew all too well that acting on one's limbs almost always leads to something fun. Nince corked the bottle of rum and turned his attention, once more, to the mirror. Nobody was using at the moment, luckily, so Nince rose from his seat. Nince swaggered over to the mirror, moving in as straight a line as his drink-numbed legs could carry him in. Within moments, too few, he thought, Nince found himself before the mirror. Nince had expected a more immediate reaction from the mirror, but when he stepped in front of it, it simply showed a reflection of the Raven, just as it was. Initially Nince suspected that he was just so remarkably one-dimensional that he really was exactly as he appeared, but before his eyes the mirror began to shimmer and change. Nince posed as dramatically as he could as the mirror changed to show him as he was. The mirror showed a man who looked like Nince, but even shorter and skinnier. He was wearing a shoddy smock over a woolen shirt and pants, in stark comparison to the (stolen) flashy robes that Nince was really wearing. The man was talking loudly, and being determinedly ignored by everyone around him. Nince was hardly surprised. He always knew, deep down, that he was more or less a very frail, shouty pauper. A frail, shouty pauper who had written a book. This bothered him very little, partly since he was determined to change the last part, and partly because he didn't really have a problem with being frail and shouty. The mirror began to change again. Nince had been particularly exciting to see exactly what it was that would make him happy. As he watched, the mirror changed to show Nince, as he was, except slightly better looking, standing on a raised platform. He was laughing and telling jokes to what Nince suspected, from the sweeping movements of his reflection's eyes, must have been a very large crowed of people. Nince's reflection was laden with bottles of spiced rum and vitae, which seemed to be clipped onto his robe. As Nince watched, his reflection unclipped one of the bottles and began to drink. Nince was very pleased with this tableau, but the more he peered into the image, the more he began to notice something in the shadows behind his double. Something moved there, hovering a few feet above the ground. As that something, that someone, moved out of the shadows, Nince recognized their face. Nince recognized that wicked glint in their mad eyes. Nince fought a very strong urge to smash the mirror immediately. Twitching, he out of the way of the mirror, the reflection disappearing. Nince returned to his seat, uncorking his bottle of rum. He had done enough soul-staring today. Bishop waited until the moon was high, when most of Norrath lay in slumber. He made his way quietly into the room, thanking the Father than no one had seen him. For this was a moment he simply could not share with another soul. Finding the rumored mirror he removed his hood, indeed a rare thing these days, and pulled the mirror round to face him. The mirror shimmered as he stared into it, the reflection it held was blurry at first. As the images became clear the edges of the mirror darkened as if enhancing the shapes in the center, reflecting the current state of his life. He saw himself standing in his newly crafted sanctuary at the Seafarer's Roost. His eyes were dark and narrowed and a smile so deadly it sent shivers through him as he studied it. The room in which he stood was lit by only a few candles placed on skulls. Kneeling at his right side was a Teir'dal woman, her hair tied back and the hue was a light pink, around her neck was an expensively jeweled necklace, her hand was curled around his calf as she looked to the ground with cold, fear stricken eyes. In his left hand he held the familiar whip so tightly his knuckles were white. In his right he held to his chest the Book of Hate. Before him were four rows of people in dark robes on their knees, each holding a single candle as they appeared to be listening to the speech he was delivering about the Prince of Hate. The image in the mirror made his chest lift with pride, knowing that even now far from the Spires he was continuing the Father's work. Soon the reflection began to shift before his eyes, and the Bishop's cold heart sank, for deep in some secret corner of his soul what he saw next is a desire he has long since buried and left for lost in his seething hatred. The edges of the mirror shifted from darkness to a bright blue sky, the sanctuary dissolved and the setting was now on a boat at sea. It was lavishly decorated and more like a home than an actual ship. He was no longer wearing his traditional black robe and the cloak he was given in honor of his Bishophood. Instead he was now only clad in a formal suit, his long silver hair blowing in the wind with a smile of sheer happiness. There was a woman standing at his side in a silky white gown, her arm around his waist. While her face was unclear, it was obvious she was Teir'dal. Her skin was just as dark as his and her long silver hair hung to her waist. On the deck below the happy couple, familiar faces smiled up at them, and glasses were raised in some sort of toast. Bishop blinked several times as the images again began to shift yet again. The reflection that began to surface before him made his breath catch and gooseflesh rise on his skin. The sides of the mirror appear to burst into flames as the shape of a house in the Death Grotto appeared. The windows implode and flames licked outward from them. The front door is open, smoke billowing from inside and the mirror's image zooms in on the door. He closes his eyes, knowing what is coming next, but he cannot help but to open them and watch as the mirror continues its story. Strung along the walls of the foyer from ceiling to floor are bodies of partially clad women of all races save Teir'dal, gutted from stem to stern. Their insides turned outward and standing in the center of the room covered from head to toe in blood is a younger version of himself, naught but barely at the cusp of his teenage years. In one hand he holds a knife that glistens in the fire behind him, the steel of the blade is tainted with blood, in the other hand he holds a still lit torch. The face of the much younger version of himself is the epitome if seething hate, his eyes are wild with amusement at the scene around him. The younger version of himself throws his head back in laughter, and though the mirror emits no sound, the memory is so vivid he can hear the maniacal laughter in his mind. Unable to take more of the images the mirror shows him he steps forward and hastily returns it to the former position. His breathing is heavy and his heart is racing as he pulls up his hood. The Bishop turns to the door and even as his hand twists the handle, he nervously looks over his shoulder. This night he has seen what he is now, what he secretly desires, and what he fears most: himself. The Bishop retreats from the room letting the door slam shut behind him. Perhaps he will return, perhaps not. Until then he will think on the images he has seen, the memories it has refreshed, and the dream he once had as he lay on the bedroll not so many weeks ago locked in the dungeons.